James Hook, organist and composer, was born on June 3, 1746 in Norwich, England and died in 1827 in Boulogne. He worked in London from 1763 until his retirement in 1820, composing a wide variety of music, including works for the stage, one symphony, several overtures, many concertos for the Harpsichord and Organ. 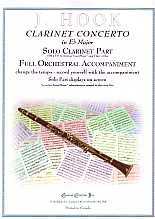 This Clarinet concerto was composed in 1812.